Water softening systems are used to soften water by cleaning the hard water minerals. The system eliminates magnesium, calcium, and various other hard water minerals present in the water. Soft water reduces the usage of detergents and soaps for cleaning and laundry purposes. It also extends the life of appliances such as dishwashers, washing machines, and water heaters. Transparency Market Research analyses the global water softening system market in terms of value in US$ Mn and volume sales in terms of thousand units. The global water softening systems market is expected to reach around US$ 7,537.6 Mn by 2026. The market is anticipated to grow in terms of volume sales at a CAGR of 3.6% during the period 2018-2026. The North America water softening systems market incurred the highest market share, accounting for US$ 1,601.5 Mn in 2016. 85% of North American households live in hard water areas. This factor, along with rising health concerns among consumers and growing research and development activities is leading to product innovations and technologically advanced products, thus driving the market. The global water softening system market is anticipated to grow mainly due to increase in demand for soft water across the globe, coupled with the supportive government policies such as smart cities. Europe and North America are geographical hubs of hard water. Therefore, some manufacturers are shifting their soft water equipment production facilities to these countries in order to match the considerable demand for water softening systems. Therefore, rising manufacturing activities is driving the water softening systems market. Demand for consumer water treatment systems is increasing due to a strong housing market, where consumers are purchasing both new and old houses. As the construction of new homes is increasing, point of entry systems and some under the sink systems are installed which are driving the water softening systems market. Moreover, rise in number of infrastructure projects coupled with installation of water softening systems is expected to be a boosting factor for the market. Growing modernization and urbanization initiatives in both developed and developing countries is an important factor fueling the water softening systems market. One of the main restraining factors impacting the growth of the water softening systems market is low market penetration in rural areas. Rural consumers are less aware of the importance of water softeners, purification, and filtering process working to prevent adverse effects on health. Rural consumers prefer substitute methods such as cloth straining, boiling, chlorinating, slow sand filtration, ceramic filters, etc. Furthermore, rural spending on water softening systems is less as compared to urban spending. The global water softening systems market is anticipated to witness decline in growth rate during the forecast period due to this factor. However, rising demand for water softening systems in emerging economies and rising manufacturing activity across the globe are opening new avenues for the market. Emerging regions such as Asia Pacific, Middle East & Africa, and South America are investing more on water purification infrastructure. Moreover, organizations such as WHO, UNESCO, and other regulatory bodies work cohesively to make available water fit for required purposes. Some of the key players profiled in the global water softening systems market are A.O. Smith Water Technologies, BWT Aktiengesellschaft, Culligan International Company, EcoWater Systems LLC, Pentair Residential Filtration LLC, Feedwater Limited, Fleck Systems, Harvey Water Softeners Ltd, Kinetico Incorporated, Marlo Incorporated, Monarch Water Ltd., Pelican Water Systems, Qingdao Haier Co., Ltd., Watts Water Technologies Inc., Evoqua Water Technologies, and Whirlpool Corporation. The water softening systems market report provides analysis for the period 2016–2026, wherein 2018 to 2026 is the forecast period and 2017 is the base year. 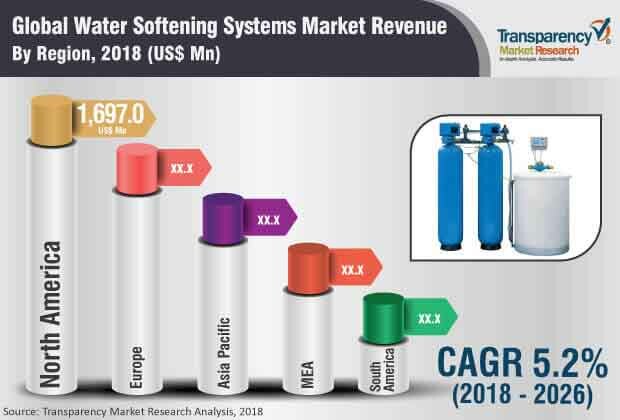 The report covers all the major driving factors and key trending topics impacting the water softening systems market growth over the forecast period. It also highlights the restraints and opportunities expected to influence the market during the forecast period. The study provides a comprehensive outlook on the growth of the water softening systems market throughout the forecast period in terms of revenue (in US$ Mn) and volume (Thousand Units), across different geographies, including Asia Pacific, South America, North America, Europe, and Middle East & Africa (MEA). The report covers the entire overview of the market including the market dynamics such as drivers, restraints, and opportunities and trends that are predicted to leverage the existing nature and prospective status of this market. Furthermore, the different industrial and residential factors affecting the water softening systems market are studied through the industry SWOT analysis. The competitive position of the water softening systems market is studied through the Porter’s Five Forces Analysis. Additionally, current indicators of diverse macro-economic factors are contextualized under key market indicators. The water softening systems market has been provided in (US$ Mn) in terms of revenue and (Thousand Units) in terms of volume as well as the CAGR (%) for the forecast period 2018 to 2026. The water softening systems market is a global report studied on the basis of type, flow rate, application, distribution channel, and region. The incremental opportunity analysis has been figured out in order to determine the most attractive segment in the approaching years. The report also highlights the competitive landscape of the market, thereby positioning all the major players according to their geographic presence and recent key developments. The comprehensive water softening systems market estimates are the result of our in-depth secondary research, primary interviews, and in-house expert panel reviews. These market estimates have been analyzed by taking into account the impact of different political, social, economic, technological, and legal factors along with the current market dynamics affecting the growth of the water softening systems market. Besides, competition matrix and market share analysis have been included under the competitive landscape to understand the top players’ contribution in the water softening systems market. Each company is studied on the basis of basic information, financial highlights, revenue highlights of regional contribution and segment contribution, and product portfolio. Additionally, the company strategy and recent developments if any are also incorporated under each company profile section. The water softening systems market is segmented as below.